These are the three main ingredients when making the delicious and famous Pineberry Jam. 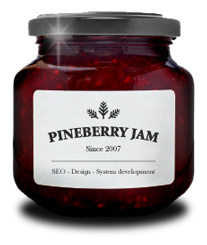 Besides being a very important ingredient in making Pineberry Jam, SEO makes websites visible in the search engines. A good placement in the search engine ranking on the right keyword equals big opportunities for a website or a company to reach more customers and consequently increase their sales. Design is the most colourful ingredient in Pineberry its reddish glow. Besides making websites look good, design is vital for making a website user-friendly and profitable. System development is the backbone ingredient of Pineberry Jam. It is important not to overuse this ingredient, since it only makes things unnecessarily complex and expensive. Do you want to learn more about these ingredients and Pineberry? Please visit our main website Pineberry.com.